Courtesy of one happy pincher. 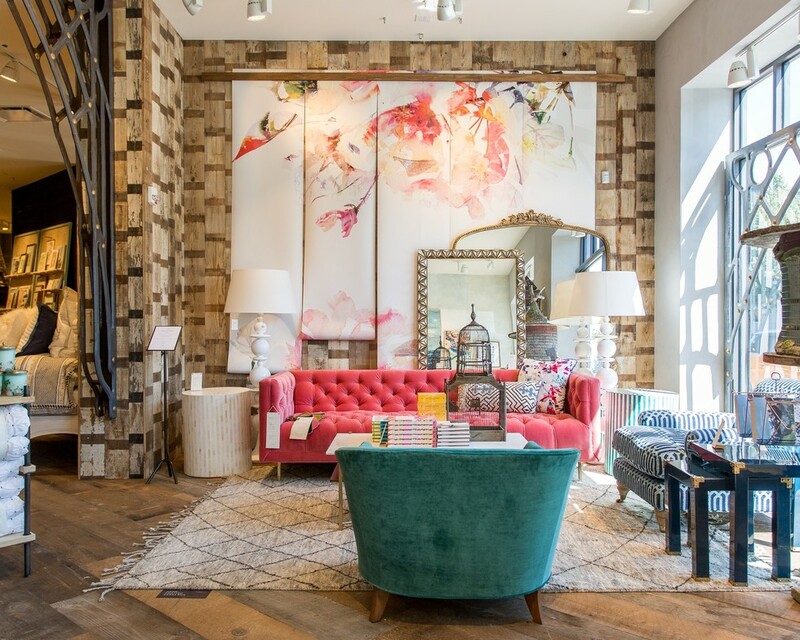 Clearly, I couldn't be more excited that the Bay Area is in the midst of an Anthropologie renaissance, with the recent addition of a pair of ginormous and stunning new concept stores called Anthropologie & Co. The Walnut Creek store debuted on South Main Street in mid-September and the Palo Alto store in the Stanford Shopping Center opened its doors just a few weeks ago. Obviously, I've checked out both outposts—and now it's time to share my intel. Here, in random order, are five of the best, coolest, holy cow-iest things about them. The new concept stores are three times the size of an average store, which translates to approximately 20,000 square feet of selling space and gobs more amazing Anthro-y things. More tees with quirk, more sparkly bangles, more fairytale frocks and more retro kitchen gadgets you didn't know you needed. Wonderful art, ceramics, and goodies from local artisans can also be found in abundance; my personal faves include SF-based Svensk Candles and prints by artists from Oakland's Creative Growth. Also part of the amazing mix are a majorly expanded beauty boutique (800 products from 90 brands) and shoe salon (375 styles from more than 50 labels). P.S. I don't deny that these Godzilla-sized spaces can be overwhelming—even for a professional shopper such as myself. The good news is the shop-within-a-shop layout makes things more manageable. My approach? Tackle beauty and shoes one day, dresses and accessories the next and so on. Interior design devotees are digging the fresh focus on furniture, including floor-to-ceiling inspiration via living room, bedroom and dining room vignettes… all worthy of the buzziest design blogs and glossies. Hands down, though, the Design Center is the real innovation here. Home stylists, armed with all manner of swatches, tear sheets, and samples, are available to help steer you in the right direction when choosing the perfect custom-designed couch, table, or chair. I suggest taking the help: There are 125 furniture silhouettes, and 90 fabrics and colors from which to choose; not to mention, the countless rug, wallpaper and curtain choices. Alas, if only I had more than 700 square feet of space to decorate. Anthro has out-Anthro'd itself. No small feat considering any regular-Jane store delivers an amazingly warm, welcoming and even otherworldly experience. (Shout out to those aforementioned candles that never seem to flame out.) While distinct in aesthetic, each concept store is immediately recognizable as Anthro. Walnut Creek has vibes of a California bungalow (those reclaimed white-washed wood floors are everything!) and Palo Alto evokes an upscale boho loft. Bottom line: There's an eye-catching design detail, a fixture with a wink, an OMG-how'd-they-do-that? architectural moment at every turn. However, my absolute favorite thing is the art installation at the Palo Alto store, made of clothespins, lording over a grandiose staircase. Magical. If you're like moi, shopping makes you ravenous. Thanks to Palo Alto's Terrain Café, Anthro's very first restaurant, you can grab a delicious meal made with fresh seasonal and local ingredients while still eyeing that sweet sweater you're contemplating. Indeed, the café's rustic-chic surroundings and menu from Philadelphia-based chef Marc Vetri, a James Beard Award winner, beautifully complement the store's eclecticism. The day I lunched, I was blown away by the monkfish with California artichokes and saffron potato puree. OK, and the polenta budino with candied hazelnuts for dessert. My sage advice here: Shop first then eat. Trying on jeans with a midday pooch is neither fun nor pretty. Inclusion of BHLDN Weddings and Terrain, Anthro's sibling brands, is key to the Anthro & Co. store concept. 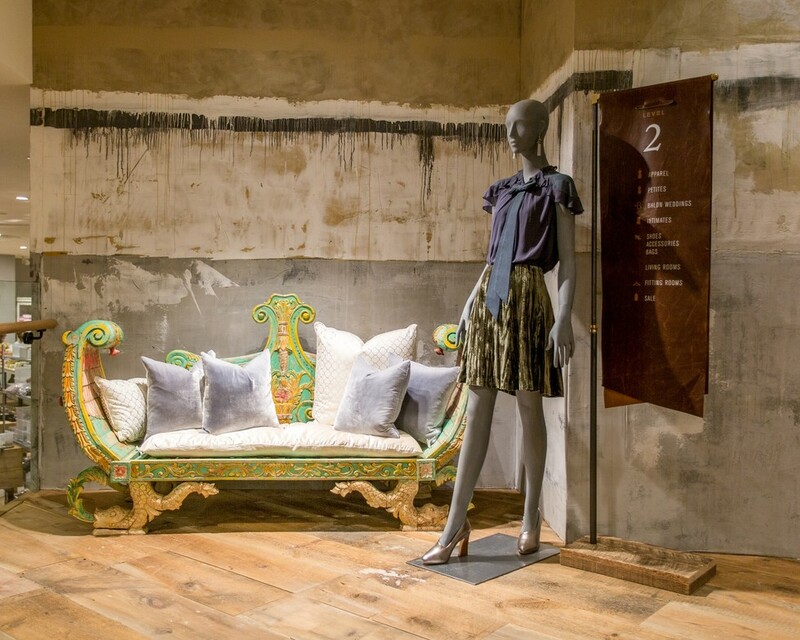 Both brands have their own curated boutiques, making shopping easy for brides-to-be and garden enthusiasts alike. Although not matrimonial-minded (at the moment), I must admit it was fun breezing by the gorgeous gowns en route to the denim department. Bona-fide fiancées, however, will appreciate the bridal accessories, bridesmaid dresses, and wedding décor and gifts. As for Terrain? Me likee. I had a blast roaming around the greenery, and checking out everything from hip garden gnomes to vintage-y planters and cheery holiday decorations. And, boy, did it smell good. 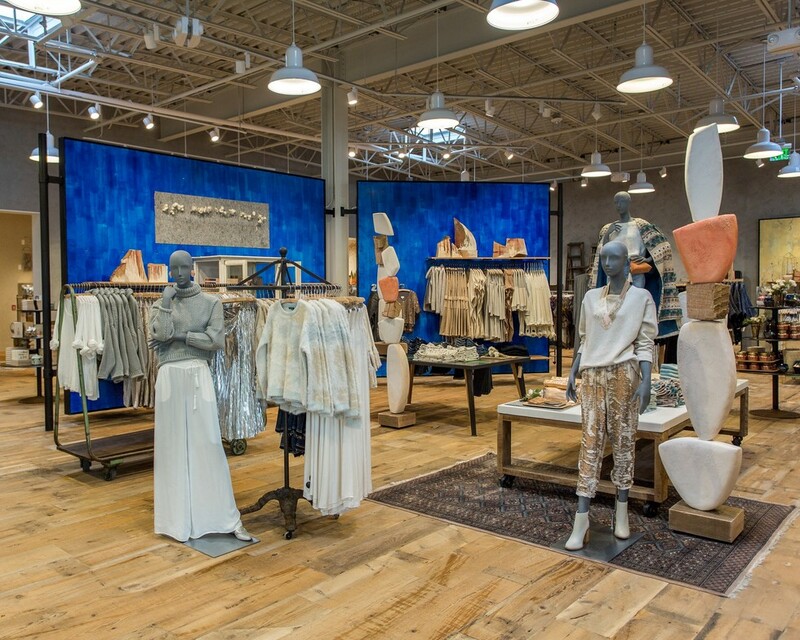 Feeling blue...winter white, metallic and oh-so sparkly on the second level of the Palo Alto store. 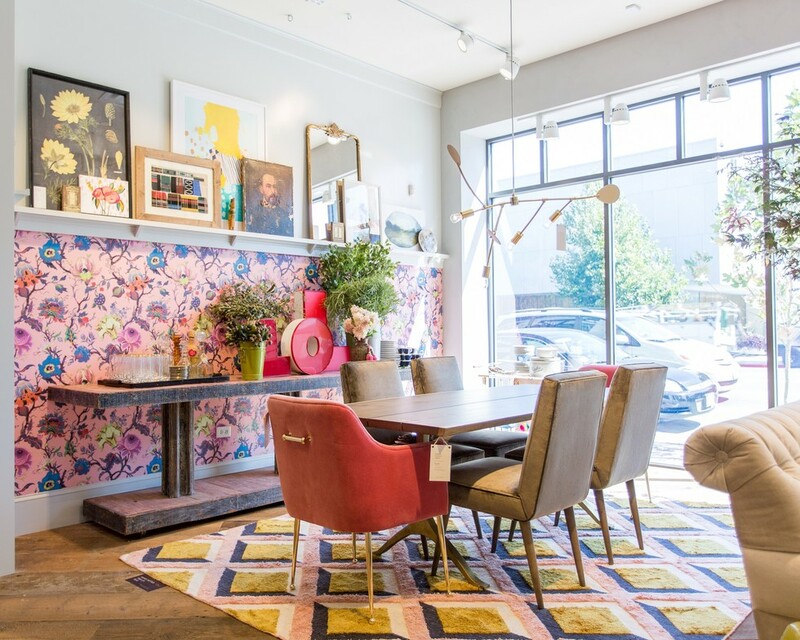 All is love and light in this punchy, Cali-cool dining room setup in the Walnut Creek store. 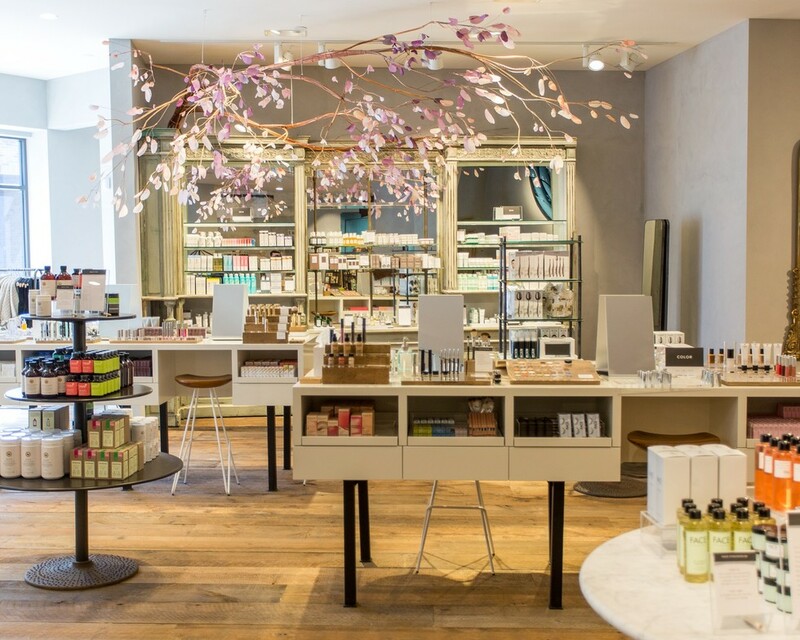 Walnut Creek's beauty boutique is beyond, with a curated selection of products. 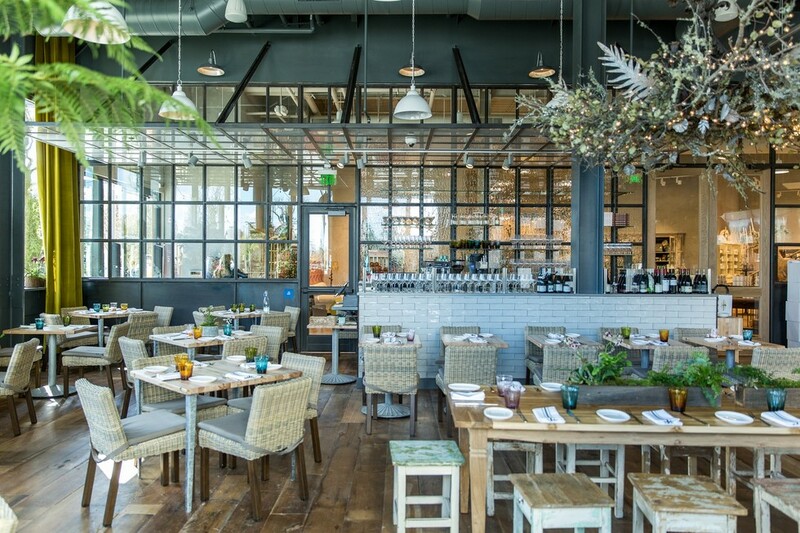 Palo Alto's Terrain Café stars a seasonal menu from James Beard-winning chef Marc Vetri. Now this is what we call a living room. 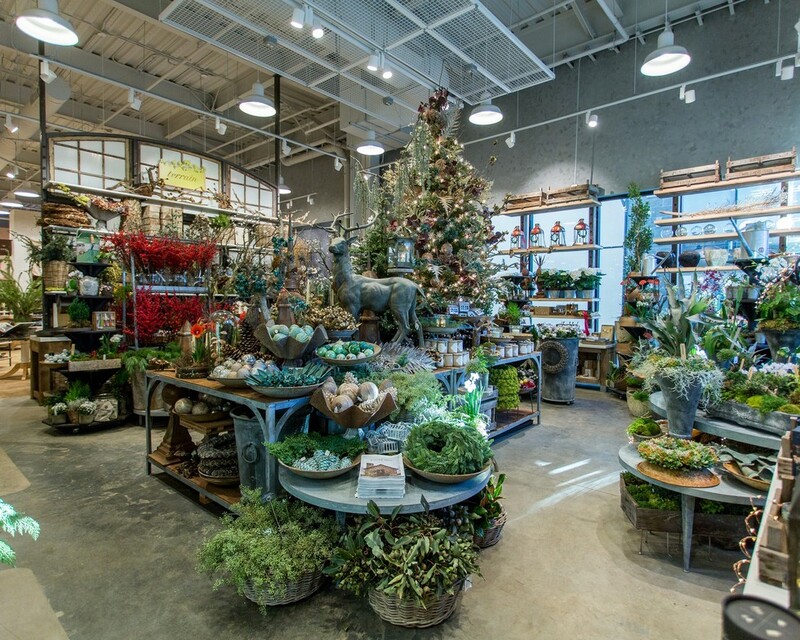 See for yourself at the Walnut Creek store. 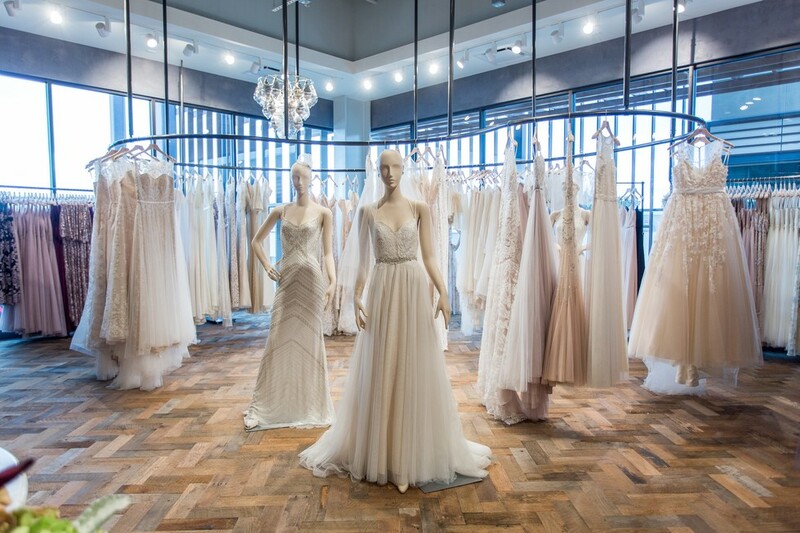 The BHLDN Wedding boutique inside Palo Alto's Anthro & Co. is a bride-to-be's paradise. 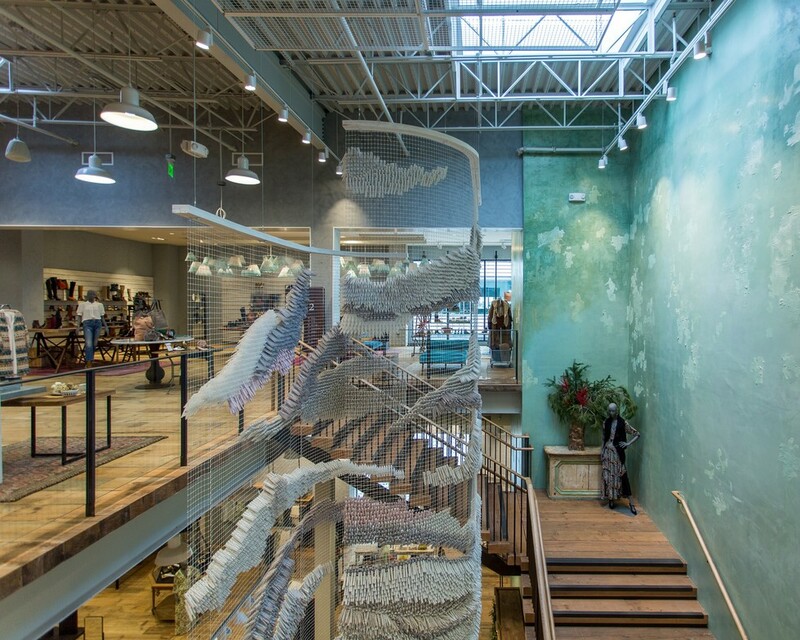 This magical art installation, made with thousands of clothespins, highlights Palo Alto's grandiose staircase. Lingerie goes dark and moody in this intimate space at Walnut Creek. Who wouldn't have the sweetest dreams in this charming boudoir? Catch some Zzzs at Walnut Creek. 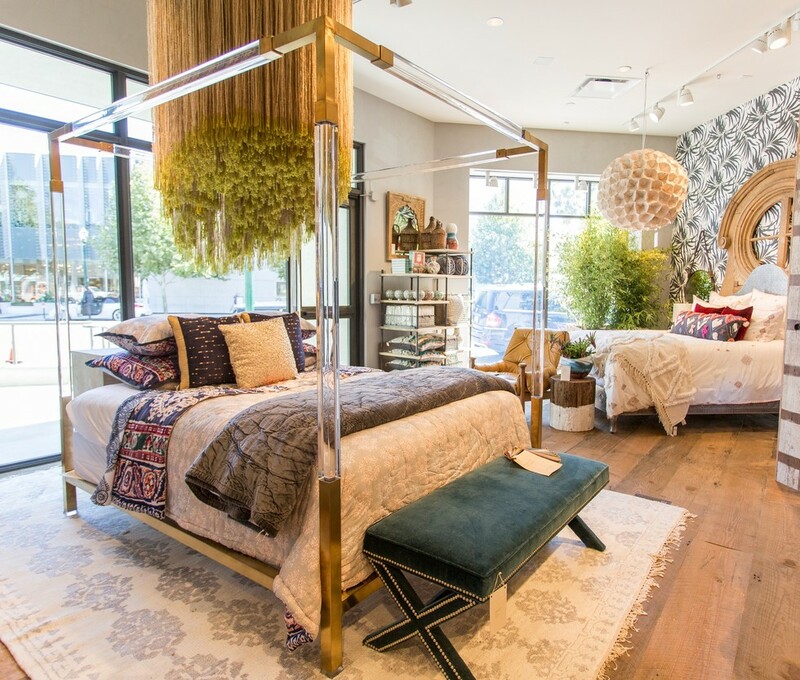 Hello, Terrain, Palo Alto: Anthro's sister brand has its own space where green is the theme.